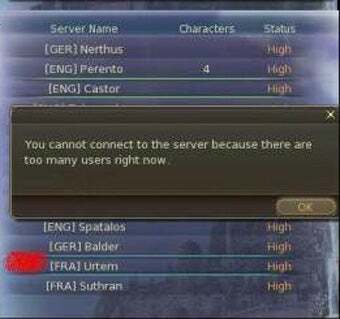 Welcome To Aion Server Queues, Europe! If you thought we had it bad in North America, many European Aion players weren't even able to get into a queue during peak hours during the game's launch weekend. Consider yourselves lucky! During the weekend several tipsters emailed us with horror stories about the European launch of NCsoft's new MMORPG Aion. Like North America, many citizens of the UK and Europe found themselves waiting in line for hours at t time to get into the game. Others didn't even get that far. Kotakuite Andrew pointed us to a set of screens like the one seen here, telling players that there were simply too many people connected to the servers to join a queue. NCsoft responded in much the same way they responded to initial queues with the much the same response they did the North American version, though today they announced the opening of two new servers, one for English and one for the French. Hopefully those two will help ease the pain of eager players across the European continent.